Is the Kellas Cat Scotland's own Black Panther? What exactly are the so called alien big cats that are constantly mentioned in the press? The police have received over a thousand reports of big cat sightings in Scotland. Some 'big cat' sightings are probably deliberate hoaxes, by people who are seeking publicity. On the other hand, many more sightings undoubtedly remain un-reported as people are afraid of being ridiculed. Some of the sightings are probably genuine cases of mistaken identity. A percentage of sightings may be large dogs - for a fraction of a second, I recently mistook a large black undocked mongrel for a 'panther', and it was only a few feet away in broad daylight. Other sightings may be an error of scale. At a distance, a domestic or feral cat could be assumed to be much bigger than it is when there is no familiar object nearby to compare its size to. Then there are the genuine big cat sightings. There have certainly been cats on the prowl in Scotland. Three lynx were reported to be have been shot or trapped near Inverness as far back as 1926, although it may have been a journalistic hoax. Felicity the puma was captured near Inverness and a Leopard Cat (originally from Edinburgh Zoo) was killed a few years ago in the Borders. The amount of evidence amassed certainly suggests that there are a few others prowling around out there. Other sightings may be examples of the famous 'Kellas' Cat - named after the village near Forres where they were discovered. These cats are probably an introgressive hybrid between Feral domestic cats and Felis silvestris grampia the Scottish subspecies of the European Wildcat. Others believe that Kellas Cats are actually an incipient new species. It all depends on the definition of a species, which is an artificial and still controversial human concept. Where exactly does one draw the dividing line? Take the case of the Lynx - until recently, the Eurasian, Spanish, and Canadian lynx were considered to be subspecies, now they are defined as different species. In another 20 years, maybe they will be subspecies again. Wildcats are probably most often seen in museums - although there were a pair at Edinburgh zoo a few years ago. The Scottish Wildcat subspecies was defined in 1907 by the British Museum; the chosen type specimen being an animal killed at Drumnadrochit on the shores of Loch Ness in 1904. Writing in 'Animals & Men' (1994) Jan Williams pointed out that "from this point the species 'evolved' by unnatural selection - gamekeepers supplied Wildcats to museums and were paid only for the ones which resembled the type specimen'. There seems to be considerable doubt whether the Scottish wildcat still exists as a true (sub)species anymore. Recent genetic and immunological studies have suggested extensive cross breeding with feral cats. Wildcats are protected under the law, hybrids are not. These scientific studies unfortunately mean that the Scottish Wildcat, as a hybrid, or even as a suspected hybrid ('not proven'), is no longer a protected species in Scotland. Give the Kellas cats time and space to evolve on their own without further crosses to either the wildcat and feral cats, and they could become firmly established as a new species in just a few generations. Perhaps they already have! That's evolution in action. It's not necessarily a long process, species can evolve in leaps and bounds or remain almost unchanged depending on environmental pressures and the gene pools. There are those who believe that the wildcat is not extinct in England, and that the Scottish and English wildcats were, if not different species, certainly distinct subspecies. Kellas cats, or an equivalent, may be living in England too. 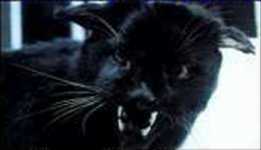 To sum up, in Scotland at least, many 'black panther' sightings may actually be sightings of a Kellas Cat. Whether these cats are just hybrids/cross-breeds or members of a new species depends merely on human perceptions.